In many of the sporadic moments that find me away from partaking in bashing my bank balance or stuffing my face, I've been indulging in street style scouting (mainly as a trusty sidekick to Mr Street Peeper). From well over a thousand yards on a bustling street in Harajuku I spotted a guy awash in print and colour colour, sporting a familiar sight in Agi&Sam's smiley trousers from AW11. It was a delight to see an emerging London designer being worn almost six thousand miles away from home. We couldn't really understand one another but we nodded in agreement at our shared love. 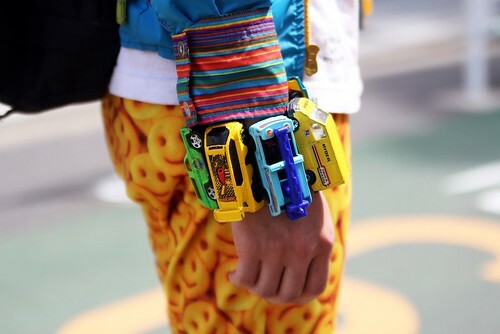 I adore the toy car bracelet! Did he buy them in Japan? Are they stocked there? Mat: Exactly! So much fun. Gems: Thanks for stopping by! Catch: Thanks for finding us. Check out Japanese designer Odradek's '10 collection... lots of toy cars!